A set of UI Elements in the style of the LPC homepage! They are all supposed to be compatible with Flare's UI set, though it's definitely not a complete reskin. UPDATE: I added an extra archive with the elements from the comment thread, including a mouse pointer, window frame, radio button, tabs, and item slots. Looks awesome. May I make a request if you got the time? I look forward to replace my current UI with these as they fit to the theme. cemkalyoncu, I can definitely promise tabs (I need them myself!) and I'll definitely take a look at doing the other pieces. Radio buttons shouldn't be hard, but I'd need some sort of reference for the window with caption. Have anything in mind? 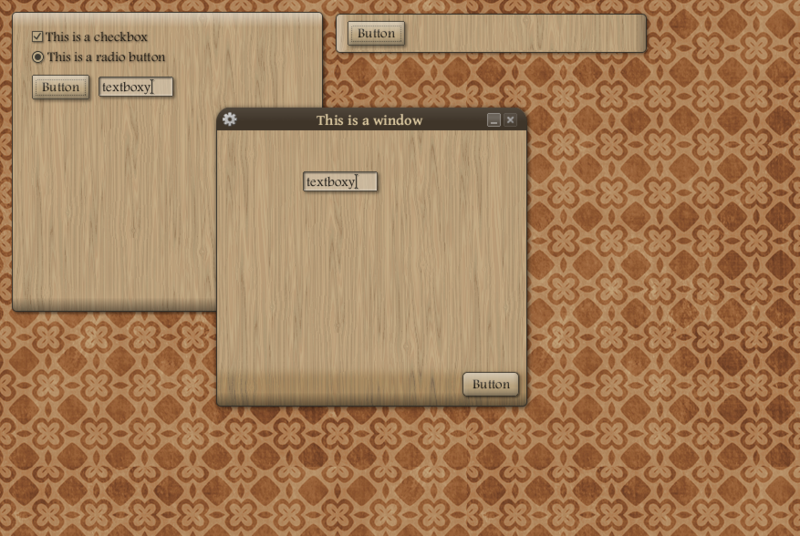 cemkalyoncu, yes, I plan on doing all the UI widgets you'll need. I should have them done by the end of the week, but if not, keep nagging me - I probably just got distracted by the other stuff for the competition. Thanks alot, I will do that. I dont want to use current UI. Hey pennomi, did you had any chance in the weekend? cemkalyoncu, sorry, I didn't. I was finishing up the main town map for my game. But I promise I'll get to it tonight - my goal is to focus only on UI stuff today. So within 24 hours, you should see the UI elements you need! @pennomi, no worries, we are not in hurry. Hey, I did the window, it does not look bad. You may add it to the submission if you like. wow this UI looks great may I ask for a square that is either 32x32 or 64x64 for my inventory screen? @dethe: if the one on top of window would do, I can create any size you like. buch: Also, very nice! I'll add those in too! 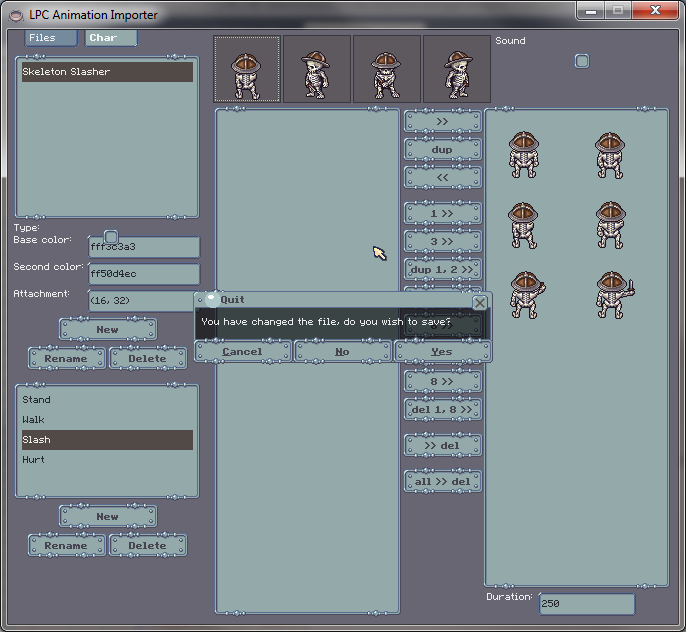 My current task is to write an importer for this UI. Ah, fun. Didn't even cross my mind. Yeah, I'll give that a shot tonight. Hey, see your UI in action. Still waiting for the pointer. I think tabs might need a fix. I forgot to tell you that we choose upside down tabs. Still working on importer, not finished yet. You can notice from the mismatched labels and missing comboboxes. I love to see my UI in action! That screenshot is nothing short of awesome! No grab or move pointers yet... do you have any reference images along the lines of what you need? Pointer looks good, generic is what I look for. Here is the hand cursors that I use. They are from a CC-0 (I think) linux cursor pack. This pack is wonderful. Thanks to the OP and the contributors. Here is a quick HP/SP/XP panel that I made from these assets. "SP" is shield points and was specific to my game, but changing it to "MP" for more generic games is no problem. @babelshift: Looks awesome! Glad to see it worked well with your game; I'll definitely keep an eye on your progress. The checkbox from this UI was used in a UI scripting demo example - thanks! I think I'm the only person in the whole world who thinks those arrows look like suitable shields for an LPC character to carry around. I talked about them briefly in another thread but thought I'd share it with you where other people can smile and chuckle about it. It was a random idea I had a while back. It's not new by any means. If you make something out of this idea I'd really love to see it usable for male and female LPC sprites more than anything else.